Everything is a difficult decision, at least to me. 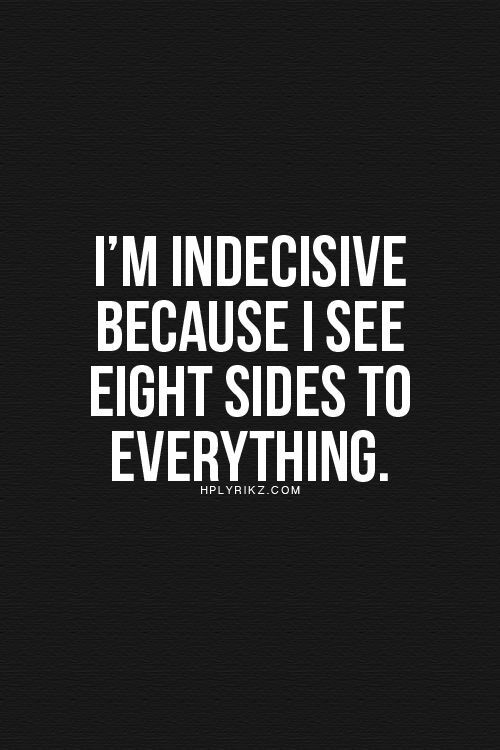 I’ve struggled with indecisiveness my whole life, but it seems to be getting worse the older I get. Simple things, fun things, everything… becomes such a chore because I spend more time thinking and worrying about it than actually enjoying myself. Granted, I’ve always been extra cautious my whole life, but I think a lot of this also comes from being sick my entire life. I’m afraid to pick or do the wrong thing, have regrets, or even worse- disappoint somebody that I love. It’s a constant battle that is raging inside of me and it’s becoming extremely exhausting. Here’s a good example: we purchased a new bed this weekend because I’ve had trouble sleeping for months. When you’re sick, there’s nothing more that you want than to just relax and sleep, sometimes all day. There’s nothing more in this world that I love more than sleeping (okay, maybe that’s not 100% right but you get the idea). Still, I literally can lay in the bed for hours- in pain, not sleeping- all because of the current condition of our bed. To be fair, our current bed was a hand-me-down from my brother, so it’s quite old to begin with. The bed frame, made of wrought iron with faded paint, is broken. The queen mattress sags in the middle now, so we tried to compensate for it by adding a 4-inch memory foam mattress pad (and not one of the cheaper ones either) . All of this has been tolerable, that is, until the rashes, muscle pain, and arthritis increased tremendously for me over the last 6 months or so. The mattress pad itself is probably the worst, though, as it is so thick and dense that it is actually harder than the mattress itself. Needless to say, after being unable to sleep (even an hour) for three days straight last week, my husband and I decided to bite the bullet and bought a new bed. Luckily, we got a smoking deal on a king sized pillow top mattress that is mixed with memory foam (the soft kind). It was the highest end model (and most expensive) they had in the store, but it was still way cheaper than the Sleep Number, Temper-Pedic, and all the other mattresses we had looked at online that we knew we could never afford (Have you seen the new Sleep Number bed -the X12– Holy cow!). Anyways, we got the perfect king mattress that feels like we’re sleeping on a cloud, with the platform leather base, and delivery for less than the average cost of a twin mattress from most mattress stores. It should be delivered this week once the next shipment comes in. I haven’t been this excited about ANYTHING in so long, I can’t even remember. Picking out the new bed was easy because I wanted the exact opposite of what we have now. The problem then lies in buying new bedding for it, as all we currently own is for a queen size bed (not to mention the linens needed to be replaced as well). Sure enough, three days later, and I’m still searching for the “perfect” bedding. There’s too many options: what is the best I can get for the money? I don’t want to spend too much (the bed was more than I should have spent, but needed). What look am I going for? I like so many things and have too many ideas. And why are the 75,000 mattress protectors, 30,000 sheet sets, and 500 comforters in the color I want. It’s just too much! It’s driving my husband crazy. But to me, I don’t want to put “cheaply” made bedding on a brand new bed. Plus, the bed linens set the stage for the feeling and design of the bedroom. Ugh, I just can’t decide. I don’t want to PICK the WRONG thing. Those of us living with a chronic illness have to not only make the everyday, regular decisions (like the rest of the population), but we also have the added burden of having to make complicated choices about our overall healthcare and well-being. Although deciding on which new bedding to buy may not be the easiest decision in the world (as I learned this weekend), imagine how much harder it is, then, to be sick with a chronic condition and every healthcare decision you make could result in truly life or death consequences. Talk about pressure! It’s no wonder that both myself and many others in similar situations have such a hard time getting past indecisive behaviors. We make so many choices in day-to-day life around our conditions. Will I take these medications the doctor prescribed, despite the side-effects? How is my energy best spent today: cleaning the house or visiting with a friend? Do I have enough spoons to make it through the day? Should I call the doctor about this symptom or wait to see if it gets better? Will I eat healthy today? Will I eat at all? We also make decisions that could impact the future of our health and quality of life. We put our bodies through hell with testing, medications, experimental treatments, etc. Exposure to too much radiation or nuclear medicine (there’s a reason that radiology techs always wear protective gear and are monitored while they are working). Many of our medications are serious stuff and could have long-term or devastating effects. some medications are highly addictive. some medications are capable of shutting down your organs over time. some of us even take doses of chemotherapy to help our conditions. most of our prescriptions are for a lifetime. and more importantly, we could die without some of these medications. To have surgery or to not have surgery: that is the REAL question. Balancing budgets and financial obligations can be hard. Sometimes we miss days, weeks, or months of work because of our illness. Some of us can’t even work at all. no work = no money, plain and simple. Healthcare is not cheap. Medical bills add up. if you’re chronically sick then you are also “chronically” visiting the doctor’s office or hospital. not just any ordinary doctor’s office, of course, but more often than not we are seeing specialty doctors – in every field of medicine. and not just any hospitals – specialty hospitals, world-renowned hospitals, and even research hospitals. prescriptions can be expensive as well. And we need them. See above. service animals (and the extra pet care costs). books or videos on management or therapy. a new bed (just kidding! ), but the list can go on and on depending on the person’s condition or individual needs. We want to have a sense of control since we have lost control over so many other things in our lives. I know what you’re thinking… it doesn’t make sense. Or does it? We want to get the control back because we feel like we have lost it. However, having full control over life requires a lot of work and is often a huge burden. Sometimes fear can get the best of us when we perceive that the world is in our hands. This added stress then makes us question ourselves and lose confidence in the choices we make. Once confidence is gone, it becomes harder to make decisions, thus back to feeling like we have no control once again. Ultimately, it’s a vicious circle. 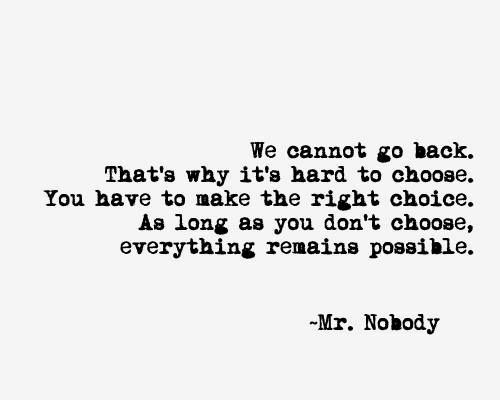 And our choices not only affect our own lives but the lives of our loved ones as well. Anxiety about making the wrong decision. Not wanting to disappoint others with our choices. Too many options offered in our modern society (i.e. bedding). and technology makes everything both easier and complicated at the same time. Fear of rejection or failure. Since being sick often requires a great deal of planning, over-thinking, and decision-making, it would be nice to have the ability to take a break once in a while. How nice would it be to have someone else make the important decisions for us once in a while? I can’t even count how many times I’ve said to my husband or my friends, “Just tell me what to do!”. Obviously, it’s not always that simple. When it comes down to it, these decisions involve your body and your life, and therefore, they are your choices to make and your’s alone (unless, of course, your underage and/or not medically able to make your own decisions legally). Learning how to manage the anxiety and stress that comes with chronic illness will help tremendously in many aspects of life, as well as in learning to cope with indecision. 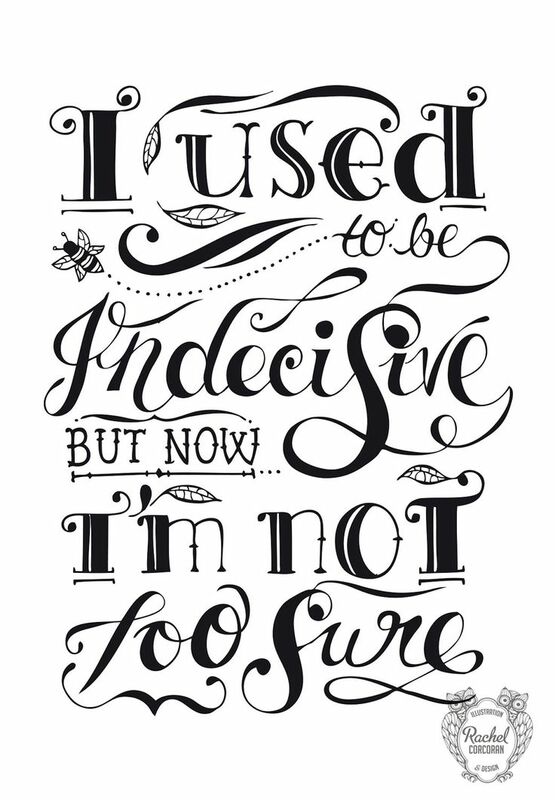 How can I stop being so indecisive? I found some great, detailed info from House of Insights that outline some steps that can be taken to overcome the inability to make decisions. According to Lorna Atkinson, the author of the article entitled 12 Tips To Overcome Indecision, “the key to making empowered decisions is to know yourself. The more aware you are of your personal biases, habitual thoughts, feelings and emotional states the greater your ability to avoid old patterns and tendencies. By disrupting old patterns, we also disrupt automatic responses and behaviors. This makes room for a fresh perspective free of past references which greatly enhances the chances of making informed decisions. 1. Know your patterns. Constantly thinking the same way programs the brain to respond in a fixed manner by flooding the body with a chemical/hormonal cocktail that produces the feelings compatible with your repetitious thoughts. We get hooked on our own thoughts and emotions that loop and feed one another. Only by monitoring your patterns to be aware of them will you have a chance to override them and their related feelings. 2. Discernment. Learn how to approach information with a critical mind and discern between beliefs, opinions and facts. Develop the ability to see the situation objectively by taking your personal preferences, biases and fears out of the equation. 3. Bust confirmation bias by stepping back and looking at the big picture. 4. Modeling the successful solutions of others. Investigate what others in a parallel situation have done and model their procedures, with your own personal twist of course. 5. Change your perspective. Play devil’s advocate and consider the opposing view point. 6. Get some distance from the problem. Sleep on it and re-evaluate by looking at it from various points of time in the future such as in a week, a month and a year. Thinking long-term helps to bypass the emotional pull of short-term solutions. 7. Write it out. With pen and paper, free associate to resolve inner conflicts. The simple act of writing gets the thoughts out of our head and seeing them on paper helps to settle confusion. 8. Wait a bit. 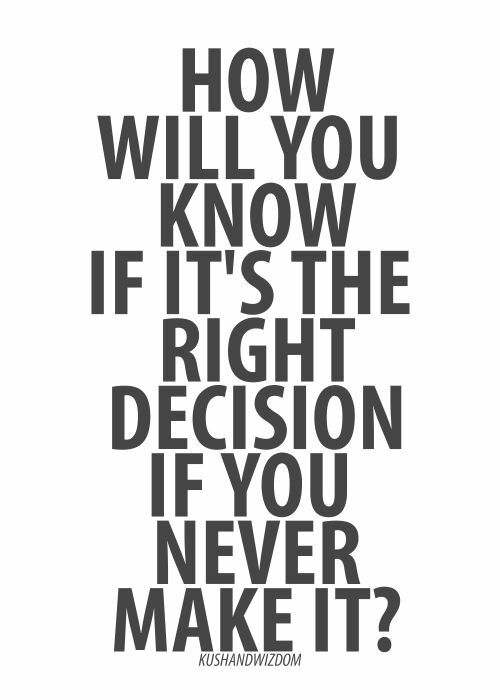 Don’t waste time and energy stewing on it before the decision is needed. Usually, new info will come in that makes the decision easier. 9. Make a commitment. Be accountable to yourself or someone else to bolster your determination. 10. Turn your problems into opportunity. Accept what is and look for the silver lining. what possibilities does it offer to move you in the direction you desire? Or to learn and grow? alternatives – what is possible? Or probable? Or impossible? expectations – what consequences will follow? preferences – what is the inherent value of the consequences? decision rule – how is a choice to be made? What are the strategies to be employed? What are the loss functions of each action? 12. Be a nonconformist. Conformity is the urge to “fit in” and belong to a group, the result of real or imagined group pressure. It’s driven by social anxiety and the individuals’ desire for status. And while group loyalty has its’ place, it has its’ perils as well. Such as committing to an idea that you don’t really believe and deferring individual interests to the well-being of the group. Often, we don’t even ask ourselves if we really benefit from the group affiliation. To make powerful decisions, learn to value your independence and self-sufficiency. Your decision must first benefit you, then the group. Now that we have the basics to consider when faced with making a decision, those situations that used to be frightening and challenging for us are now a platform for practicing the steps to make empowered decisions. Use the tips above and start with small decisions. Making small decisions will build the characteristics of self-esteem, confidence, and self-reliance. And these traits help develop the emotional makeup necessary to be successful in life. And once we have some success with our new procedures, making the big, important decisions will be much easier in the future” (Atkinson, 2013). Make sure when when you pick out sheets to get “Deep pocket” fitted sheets. The other are too short in depth and will not stay on well. This, especially if they shrink at all! Yeah, I swear the more decisions i have to make, the worse I get at making them. My just keeps going and going… part of it definately can explained by anxiety, but I think the tremendous number of decisions we make is a bigger factor. I love, love this piece! 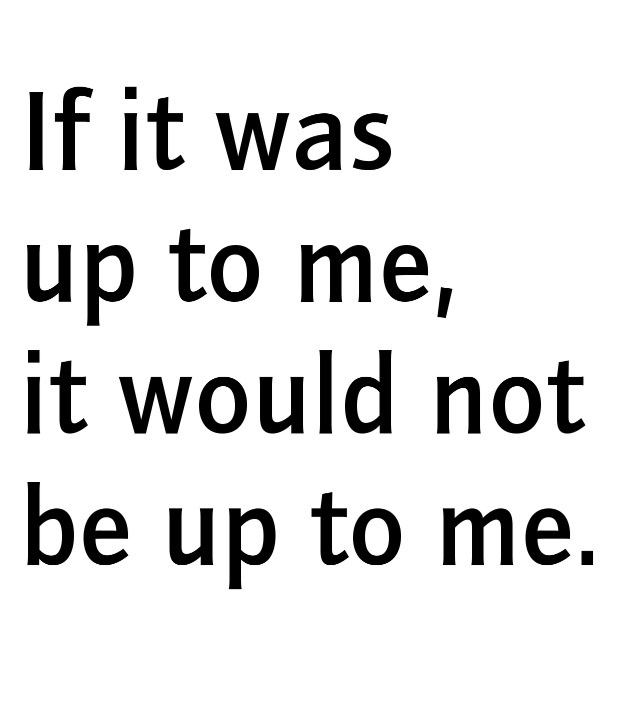 “If it was up to me, it wouldn’t be up to me” stood out. It is so very true. More decisions associated with chronic illness and there is no right way to go about it. And if we choose the wrong decision, we usually suffer consequences more harshly than the average person. Ie. Medication changes or even doctors.